The Big Easy is increasingly living up to its name, as a laid-back approach to hospitality in its growing craft bar scene is delighting fans, writes Gwendolyn Knapp. It’s no secret that New Orleans is a city built upon strong drinks and stronger hospitality, from the legendary Sazerac Bar to Arnaud’s French 75. It’s also a city with a rich history of neighbourhood dive bars. So it was only a matter of time then, in a place regarded for famous cultural mash-ups like Creole cuisine and improvisational jazz, that these two ends of the drinking spectrum would collide. In fact, New Orleans has been ushering in a slew of craftier dives and unpretentious bars of late, attracting tourists and locals alike with approachable service, casual airs and fabulous cocktails. While craft-focused dives may have already made waves in larger cities like San Francisco and New York, New Orleans’ ongoing restaurant and bar boom has only very recently lended itself to this budding trend. Locally, the French Quarter’s Bar Tonique ushered in the no-pretences cocktail trend in 2008, but in the past two years alone, even as many high-end restaurants with exceptional cocktail programmes have continued to sprout up – Compere Lapin, Brennan’s, and Square Root, for instance – the trend in stand-alone bars is turning more and more casual. Some of the city’s finest bartenders seem to be leaving their fancier posts to run or open casual spots, and bringing their craft training and technique with them. Why? “Not everybody feels comfortable in a fancy bar, but everyone feels comfortable in a neighbourhood dive bar,” says T. Cole Newton, the founder of Mid City’s Twelve Mile Limit, one of New Orleans’ preeminent craft dive bars and what Newton calls the “gateway cocktail bar”. Here, aspects of cocktail culture that have often been confined to high-end establishments are made more approachable by a casual setting. Cost, for instance will run you between US$6 and US$8, almost unheard of at other craft establishments. Kimberly Patton Bragg of Three Muses believes bartenders are finally being more conscious of speed as well. “Making one of my craft cocktails takes as much time as making an Old Fashioned or a Cosmo,” she says – important at high-volume places such as Three Muses. Approachability is a key element at Barrel Proof, which Sylvain’s Liam Deegan and Robert LeBlanc opened last year, venturing away from your run-of-the-mill craft bar to open an unassuming neighbourhood hangout with a stuffed bobcat peering out from the back bar and the best whiskey selection in town. The house drink is a can of Schlitz and a shot of Old Grandad, but Deegan is equally as comfortable discussing the tasting notes of Yamazaki 18 as he is making an Old Fashioned. “I think there’s definitely a focus on hospitality in the industry right now,” he says. At the higher-end establishments in New Orleans, shedding elitism and exclusivity has become more important than ever, perhaps driven by the new competition and a casual approach to cocktail culture in the city. Cure owner Neil Bodenheimer admits: “Back when we opened, service was a bit more antiseptic. You can’t be that way now.” The beloved Freret Street bar was once even home to a dress code – no shorts allowed, even in the summer – which has long since been abandoned. Nowhere is the trend toward casual cool more evident than among the city’s growing tiki destinations. Newly-opened Beachbum Berry’s Latitude 29, the highly-anticipated and wildly fun tiki mecca that recently replaced a former upscale eatery inside the elegant Bienville House hotel, rings a gong for last call. If it’s a Tuesday, one should head to The Saint, a dive bar that does Tikioki Tuesday, pairing wondrous frozen concoctions with a karaoke songbook made for metal heads. The only stuffiness you may have once found there – a wall of cigarette smoke – no longer exists as the city has banned indoor smoking. 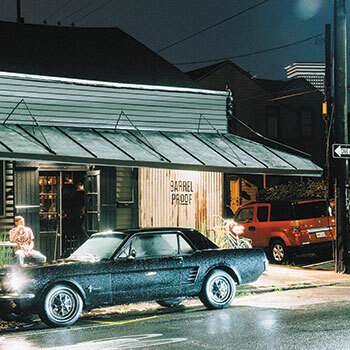 Flick through the next few pages to discover the best bars in New Orleans.